The Steele Building is being reinvented as a place for ideas and innovations. Built in 1912, it now features four floors of loft style office space for Philadelphia’s creative tech companies and entrepreneurs. 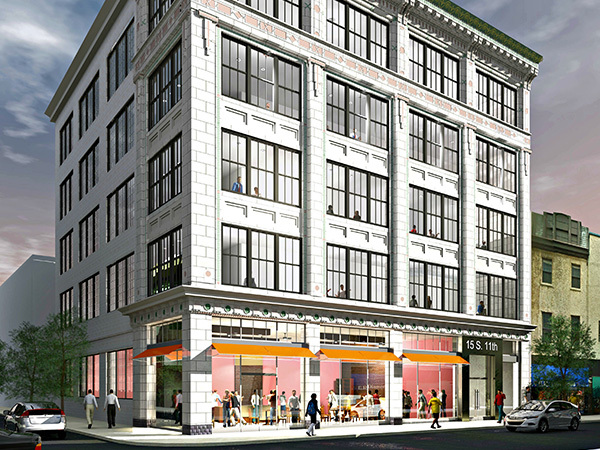 Located at 11th and Ludlow, the Steele Building is in the midst of the most up-and-coming section of Midtown Village. On the former site of a vaudeville theater, the Steele Building was designed and built by William Steele Sons & Co. in 1912. The Steele family came to America with the dawn of the Gold Rush - an era of ideas and innovations that now reflects the building’s new use as a coworking space. The Steele Building was originally home to Horn & Hardart’s Baking Company - the innovative creator of the Automat, a self-serving vending machine-style restaurant concept that was popular in the early 20th century. The Automat shared the Steele Building with a number of other tenants throughout the years, such as Geuting’s Shoe Store and Sol Cohn & Sons Cloaks and Suits, solidifying its place in the shopping and garment district of Philadelphia.